Getting enough potassium doesn’t have to be hard, and as long as you’re in good health and eating a balanced and varied diet you are most likely at an acceptable level. Because of the healthy benefits it provides, it’s good to know which foods provide the most potassium so you can know without a doubt that your needs are met. You’ll get various amounts of potassium from fruits and vegetables, which is why it’s so important to make them a big part of your daily food intake. You’ll also find it in dairy products, as well as in fish and other meats. We’ve listed the top 15 foods highest in potassium so you can seek them out as a way to consciously improve your potassium level. NOTE ON IMAGE: Please feel free to repost this image on your website if you also give a linkback to this page. Thanks and enjoy! Cooked or uncooked, and no matter the type, beans are high in potassium. Some are more rich in potassium than others, and some potassium is lost during the cooking process, but overall this is your best bet if you’re looking to get more potassium into your diet. Beans are also a good way to help balance your blood sugar levels, as they’re digested slowly by the body and help avoid spikes. 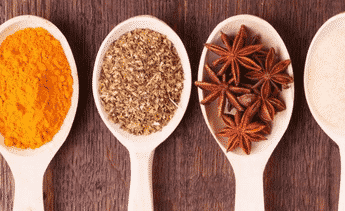 They help keep you feeling full for longer periods of time, and are high in fiber, and are often used in weight loss programs for these reasons. There are many extra benefits to eating beans, in addition to their high levels of potassium. 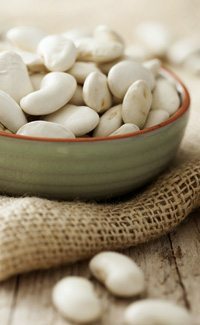 Tips for eating more: Beans are a versatile food that makes a great side dish to any meat-based entree. You can also add them to soups and chilis if they aren’t listed on the recipe, as they’ll often add more texture and flavor to the dish. Kale has been the trendiest health food in recent years, and part of the reason why it gets so much press is its level of minerals, including potassium. It even manages to outdo spinach, the leafy green that often gets brought up in a conversation about foods high in potassium. In addition to being high in potassium, kale is also a good source of vitamins A and C, calcium and magnesium, and is even a source of protein. There are many different types of kale, so be sure you try out several types so you know which ones you like best. Curly kale is the most common, with baby kale rising in popularity, and there’s even a type called dinosaur kale. Tips for eating more: Kale can be swapped for spinach in most recipes in order to shake things up. You can also make kale chips as a healthier alternative to potato chips. Baby kale makes a great base for a salad. Avocado has been surging in popularity lately, with fast food chains adding it to their menu and promoting its health benefits. 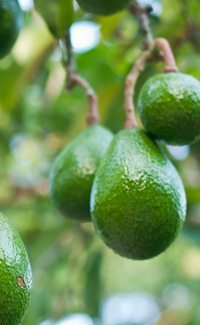 One feature of avocado that often goes overlooked is just how much potassium it has. Avocados are rather versatile, you can simply scoop them out of their shell and eat them whole, or blend them up in a smoothie. You can cut them in half and use them as a base for other foods. Avocados have a lot more going for them than just potassium. They’re a great source of healthy polyunsaturated and monounsaturated fat, as well as fiber. It’s good to get these healthy fats daily, and keeping avocado around is an easy habit to get into. Tips for eating more: It’s easy to eat more avocado because it lends itself to so many different meals. You can eat it as a side, or incorporate it into the meal itself. Guacamole makes a great anytime snack. Spinach is the quintessential healthy food, and it’s no surprise that it’s also high in potassium. Bananas get a lot of attention for their potassium content, but ounce for ounce spinach bests them in the potassium department. When eating spinach you’ll want to opt for organic, and go out of your way to seek it out. Spinach leaves are very absorbent, and when grown conventionally they’ll soak up herbicides and pesticides like a sponge, holding onto them until you eat it and break it down. If you choose one veggie to go organic with, make it spinach. 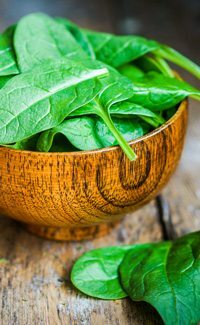 It’s a good idea to add spinach to your plate, as it’s not just high in potassium but also high in fiber, iron, as well as an assortment of other vitamins and minerals. Tips for eating more: Spinach is the default ingredient in a green smoothie, and this is a great way to get more of it, especially if you’re not fond of the taste. With all of the fruit in the smoothie the taste of spinach is at its lowest, and all that remains is its green coloration. Salmon and other fish are a great source of potassium, and also bring to the table protein, and omega-3s in many cases. You’ll want to be picky about the quality of the salmon you are eating, as they’re not all created equally. Go with wild caught Alaskan salmon for the most benefit to your body. 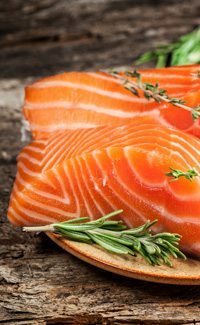 Avoid farm-raised salmon, as it contains enough chemicals to ruin any benefit you may have gotten from it. Salmon is a great choice for your regular menu because it isn’t just rich in potassium, it contains plenty of protein and is often lauded for its omega-3 content. Tips for eating more: Salmon is most often consumed as the main entree of a meal in fillet form. You can try making your own sushi using salmon, as this adds a bit of novelty and isn’t as hard as it seems. Try making a salmon avocado sushi roll for plenty of potassium and flavor. 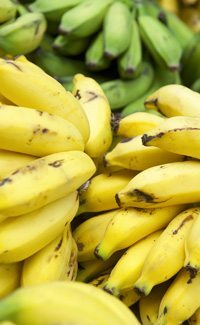 Perhaps you thought bananas would rank higher on a list of foods with the most potassium. It’s common knowledge that bananas are a good source of potassium, and interesting to see that there are 5 other well-known foods that have more potassium in them than a banana. But that’s not to say that bananas are any slouch in the potassium department, one medium-sized banana provides a full 12% of your daily value of potassium. That’s a pretty sizable chunk, and as long as you’re eating an assortment of fruits and vegetables you’ll easily meet your needs. In addition to the potassium they contain, bananas are also a good source of fiber, Vitamin B-6, Vitamin C, and Magnesium. That’s a lot for just one fruit, and because they’re naturally sweet and tasty it’s not hard to add them to your day. Tips for eating more: Bananas are the ultra-portable fruit that can go anywhere and provide sustenance wherever you are. But if you just want to eat them at home, that’s OK too, they go great cut up on oatmeal or blended up in a smoothie. This one was a surprise to us, with mushrooms having essentially the same amount of potassium as a banana. Of course there are different types of mushrooms, and each carries with it its own level of potassium, but in general you can’t go wrong with mushrooms if you’re looking to increase your potassium. You can try a new type of mushroom everyday for a month and still not try them all. 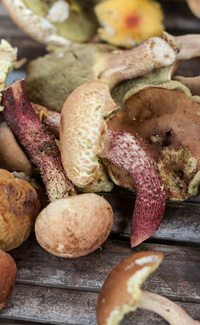 Rather than always go with the most popular white mushroom, why not venture out and try some of the other kinds? Shiitake mushrooms are a wonderful mushroom, and provide other health benefits besides potassium. Tips for eating more: Mushrooms can be added to any entree to increase its flavor and potassium content. They’re a popular pizza topping, and if you opt for a portobello mushroom you’re getting a potential meat replacement because of its heft and texture. What isn’t broccoli high in? This superfood makes more lists than any other food besides spinach. It’s going to provide you with plenty of protein as well as many other essential building blocks of life. Broccoli is often used as a side dish, but you can also look for recipes that incorporate it into the main dish. Always start with fresh or frozen organic broccoli, and cook until tender. Try not to overcook it, as the broccoli will turn mushy, and you’ll end up cooking off its vitamins and minerals. Broccoli is also an excellent source of Vitamin C, and a 100g serving of broccoli not only provides you with 9% of your Daily Value of potassium, it also gives you a full day’s worth of Vitamin C, and then some. 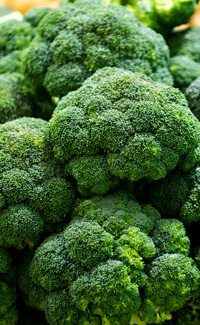 Tips for eating more: Some may not like the taste of broccoli, but it’s a vegetable that can be cooked in a number of ways to enhance its taste. Try roasting it, which gives it the amazing flavor and softens it up to perfection. Beets and beet greens are both rich sources of potassium. 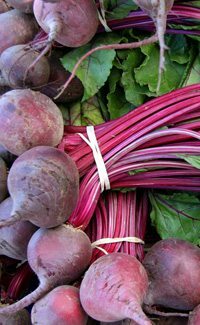 Beets are a vegetable that is best consumed during the winter months, as they are harvested just before winter approaches. If we included beet greens on our list they would rank number one, but we crafted this list based on foods you’d be most likely to eat. 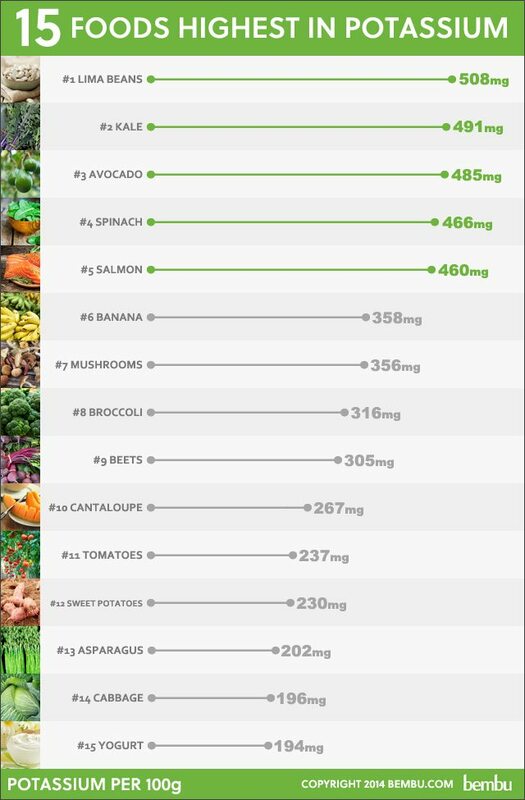 Beet greens are a bit bitter, but if you can work them into a smoothie or as a salad topper, they will provide you with more potassium than anything on this list. The betalains in beets are a bigger reason to eat them than the potassium they contain. This is a specific antioxidant which is found primarily in beets, and provides you with many health benefits. Tips for eating more: Never buy pickled beets, as you won’t be getting all of the good things that beets provide. Opt for raw beets and roast them in the oven. You’ll be amazed at the flavor difference, and you’ll be preserving the betalain it contains and getting more potassium too. Here’s a delicious way to get more potassium. This popular summertime fruit will load you up with potassium, as well as other antioxidants. It’s one source of potassium that’s a pleasure to eat, thanks to its sweet and succulent taste. Cantaloupe will also give you a big boost of both Vitamin A and Vitamin C, two antioxidant vitamins that will help your body battle the free radical damage that takes place in the body daily. 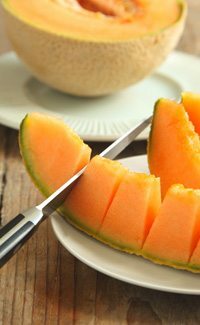 If you’re also looking to lose weight you’ll want to go easy on the amount of cantaloupe you consume per serving, as it is also a bit high in sugar, and this can turn into fat if eaten in high amounts and not burned off throughout the day. Tips for eating more: Cantaloupe makes a great addition to a fruit smoothie in the summer. Try mixing it up with other melons like honeydew and watermelon for more variety and an assortment of vitamins and antioxidants. Tomatoes have a lot to offer, and their potassium content just adds to the number of reasons why you should be eating them. 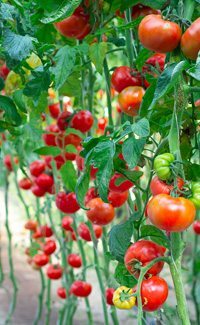 It’s best to buy organic tomatoes, as these will provide you with all of the benefits, and none of the drawbacks associated with conventionally grown tomatoes. When a food item has so much going for it, you don’t want to detract from those nutrients by introducing chemicals and poisons at the same time. The lycopene in tomatoes is what usually makes the news, and is the number one reason why you’d want to eat more tomatoes. Make sure you cook your tomatoes to unlock the most lycopene possible. Tips for eating more: Tomatoes can be added to a salad in raw form, try cutting them up in different ways to keep in interesting. As a paste you can use them in soups and chili. Stewed tomatoes also work well in soups and casseroles. There are plenty of easy ways to add more tomatoes to your cooking. Sweet potatoes are a pretty impressive source of potassium, considering all of the other benefits they provide. You can’t go wrong by adding them to your regular menu, and you’ll find that they’re very easy to work with. 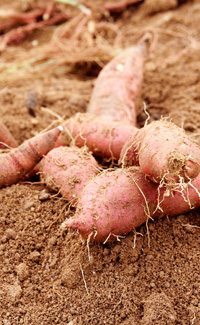 Sweet potatoes have been used more and more as a stand-in for white potatoes, because overall they have more to offer. But in regards to potassium both white potatoes and sweet potatoes are a good source. Sweet potatoes are no one-trick pony. In addition to being a good source of potassium they also rank high in fiber content, and contain beta-Carotene, as evidenced by their orange color. Try different types of sweet potatoes to see which ones you like best. Some are sweeter, and others are more savory. Tips for eating more: Sweet potatoes make a good replacement for white potatoes in just about every recipe. They can be baked solo and used as a side dish for many main dishes. They also make a great soup, and when you add butter and maple syrup to them they taste like a dessert. Asparagus is one vegetable that provides plenty of potassium per serving, and also pairs well with other high-potassium foods. For example, you’ll often see a side of asparagus spears paired with a salmon fillet. This alone would be a good source of potassium, but consider adding a baked sweet potato to complete the meal and add even more potassium. That meal would provide you with protein from the salmon, carbohydrates from the sweet potato, and potassium throughout. 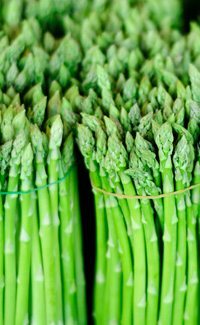 There are plenty of side dishes you can make that include asparagus, and eating fresh, raw asparagus on top of a salad is truly a treat. Tips for eating more: When asparagus is in season there’s no other vegetable that can touch it in regards to natural flavor. Look for it in the spring, and load up on it at this time. 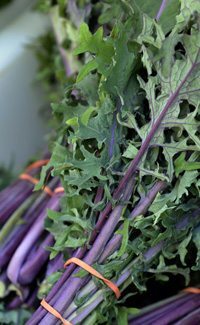 You’ll find it at a fair price at your local farmer’s market since it will be in abundance and freshly harvested. It’s common knowledge that cabbage is a healthy food, but being high in potassium is a little-known aspect of it. It’s just one more reason to get more of this cruciferous vegetable. 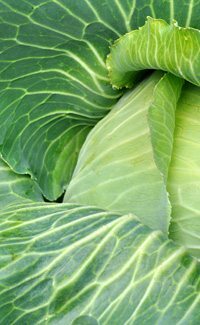 Cruciferous vegetables like cabbage are consistently making the news because of the promising research that shows anti-cancer benefits, as well as other healthy properties. They’re also shown as being good for overall heart health, two big reasons to get more of them. These include cabbage, broccoli, kale, Brussels sprouts, cauliflower, and more. Cabbage is also a respectable source of fiber, and is often brought up as a food that is helpful with weight loss, as it helps to regulate the digestive system and boost metabolism. Tips for eating more: Cabbage soup is arguably the best way to get more cabbage. There are plenty of healthy cabbage soup recipes available, and you can make a big batch that provides you with a week’s worth of nutritious lunches or meal starters. Yogurt is one example of a dairy product that contains decent amounts of potassium. While not as good of a source as many fruits and vegetables, it can still be used as part of a healthy diet. It may sound gross, but yogurt is made by introducing bacteria to milk, but these bacteria are helpful to the body and can aid in digestion. Yogurt has been making the news because of the recent and growing awareness of good digestive bacteria and enzymes. 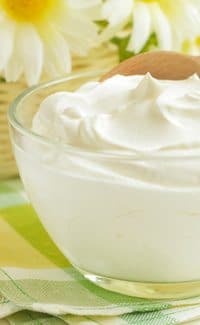 Regardless of whether or not it helps with your digestive health, yogurt is still a good source of potassium and other nutrients, and worth eating on a regular basis. Tips for eating more: Yogurt makes a great snack, and you can Avoid the fruit flavored yogurts so prevalent in the supermarket. Buy organic, plain yogurt and add your own fruit to it. Adding fruits found on this page would make it a real potassium booster. You are doing a disservice by excluding potatoes, which is one of the best sources of potassium. A large potato has about 1,500 mg of potassium. It is mind-boggling that you would leave it out. I also find it annoying that you do not explain how many mg per gram, ounce or any other measurement. Where did you get your information from? Kale high in potassium? Are you kidding? This is one of the low in Potassium greens.